"I owe it to America to be connected with America's causes, liberty, equal justice, respect for the dignity of all people... Our identities and sense of worth are not circumscribed but are enlarged by serving good causes bigger than ourselves." 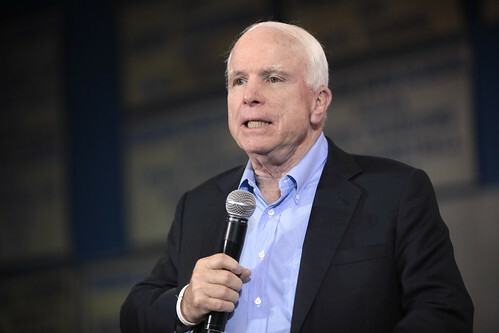 Senator John McCain, 2018. Many of the commentators that fill our airwaves with their opinions have offered that Senator John McCain's death ceremonial was a rebuke to the current administration. I feel that nothing could be further from the truth. In fact, Senator McCain, in his last, perhaps most significant public statement, was not offering a rebuke. But was instead offering a vision, to help his fellow Americans perceive what is true. Before I delve further into Senator McCain's words and the structure of his ceremonial, I want to offer a perspective on where I am coming from. Most of my adult life has been spent in the process of litigation before one of our most sacred institutional structures: The jury. I have been proud to live a life trying to aid those who participate in jury service to fulfill their most important duty--to determine the truth. Each and every jury, in America, has as its responsibility, the duty to determine what is true in the case before them. Curiously, we do not ask them to make this determination by bombast and harangue. We do not ask them to perform this solemn duty by enflaming passions and stirring prejudice. No. We ask them to set these feelings aside and determine what is true based on the facts presented to them and on the law given to them. But we do one more thing. We offer them a comparison. Two stories are always presented. And in this way the path to truth is aided by the power of comparison. Why? BECAUSE BOTH STORIES CANNOT BE TRUE. Only one is true. The other must be false. And this is how we aid jurors in their task. We present a window that allows them to perceive the truth, as it existed, in that situation.